During the 7thweek of 2018 (12.02.2018 – 18.02.2018), the Republic of Macedonia registered 3728 influenza cases/flu-like diseases(I=180.2/100.000). Compared with the number of registered cases in the last week, are increased for 26%(chart 1)and increased for 15% compared with the cases of the last season. 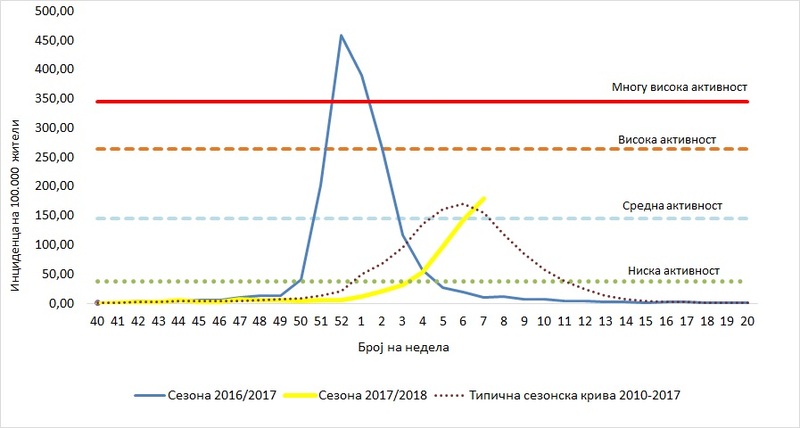 This week the biggest number of influenza cases is registered in Skopje, n= 541 and also, the highest incidence is registered in Kavadarci (I = 590.2/ 100.000). In the 2017/2018 season, the total number of influenza like illness (ILI) cases is 12171 (I = 588,2/ 100.000).Compared with the previous season (34103 cases), the number has decreased. 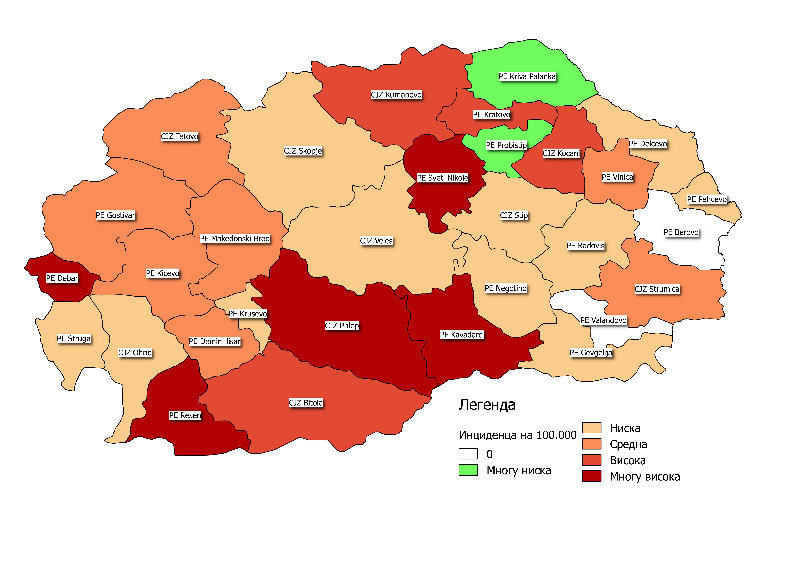 This season the biggest number of influenza cases is registered in Gostivar-1747, Tetovo-1258, Kumanovo-1222, with the highest incindence in Debar(I=2500.5 /100 000). Since the beginning of the season 2017/2018, the laboratory received 252 materials, of which, 111 are positive (44%) for the presence of the influenza virus, 38 subtyped as Influenza A of which (30 are А(H1N1)pdm –and 8 Influenza A non-subtyped), and 73 are Influenza B (Yamagata). The situation is common for this time of year. In terms of geographical distribution, 8 countries are sporadic, 4 local, 6 regional and 30 widespread. Low intensity of activity is registered in 13 countries, medium 29, high – 6 countries, and in 2 (Luxembourg, Albania) there is a high intensity of activity of the influenza virus. 51% samples were confirmed as positive. So far, influenza type A is predominant with 33%, and most of the viruses are subtyped as А (H1N1)pdm09 with 65% and influenza type B with 67% (97% – B/Yamagata). B / Yamagata type is dominated by the registered Influenza B viruses, but this type is not included in the trivalent vaccine for this season. Based on the data provided to EuroMOMO, mortality among older people has increased over the past weeks, especially in the countries of the western part from Europe.